The Lok Satta Party, which is ahead of all other parties in naming candidates for 25 seats in the 2014 elections to the Legislative Assembly, is now gearing up itself to finalize a ‘Janam nunchi agenda” (a people’s manifesto) to realize the dreams and aspirations of different sections of people. 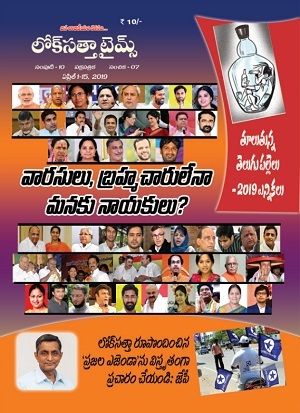 As a first step, Lok Satta Party’s national President Dr. Jayaprakash Narayan, State President Katari Srinivasa Rao and other leaders will be interacting with mostly disadvantaged and voiceless people engaged in the unorganized sector in Hyderabad city for four days beginning tomorrow, Saturday (February 15). 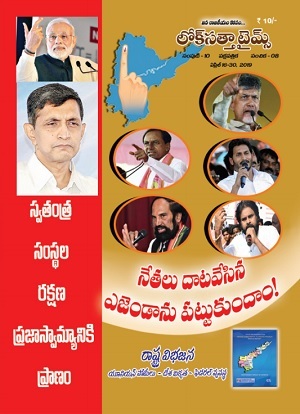 According to Lok Satta Party estimates, there are nearly a crore of people in the unorganized sector in Andhra Pradesh, Broadly they come under the categories of building and other construction workers like carpenters, plumbers and electricians, motor transport workers including taxi and auto drivers, employees of shops and establishments including private schools and healthcare institutions, self-employed people ranging from barbers and tailors to potters and weavers and senior citizens. “This is only the beginning in our bid to draft a manifesto of the people and for the people. We will meet other sections like youth, women and farmers in the days to come all over the State,” said a top Lok Satta Paty leader. The Lok Satta Party believes in making people self-reliant, in contrast to traditional parties which try to woo them in elections by offering sops. During their interaction with various sections of people, Lok Satta leaders would like to get a feedback on their problems, aspirations and ambitions and ways of addressing them.